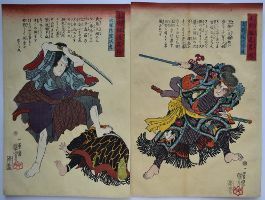 A complete diptych showing Inukai Kempachi wielding an iron truncheon against Inudzuka Shino who stands, sword drawn, with one foot on a fallen follower of Kempachi during the fight on the Horyukaku roof of Koga Castle. A well-known episode from Kyokutei Bakin’s famous book, Nanso Satomi hakkenden, “The Chronicles of the Eight Dog Heroes of the Satomi Clan of Nanso.” From a set of prints Kendo ryaku den “Abridged Stories of Our Country’s Swordsmamship.” Published by Kadzusa-ya Iwazo, c. 1845-6. Robinson S37.6.5. The complete diptych is rare.